Tuff [sic] luck for the people who have their birthdays on February 29th. You haven’t got one this year. Did two cards today, nearly three, in SMP. My interest in the TV series was clearly not waning. This must have been a tie-in book that was available for pupils to borrow from the school library – a room that doubled as a classroom and which also housed, tantalisingly, the music trolley. Many’s the time I went into the library ostensibly to find a book but in reality to scrape a guiro. We had a supply teacher. He came on a Monday. He was called Mr Mundy. He was still there on Tuesday. I never saw him again. 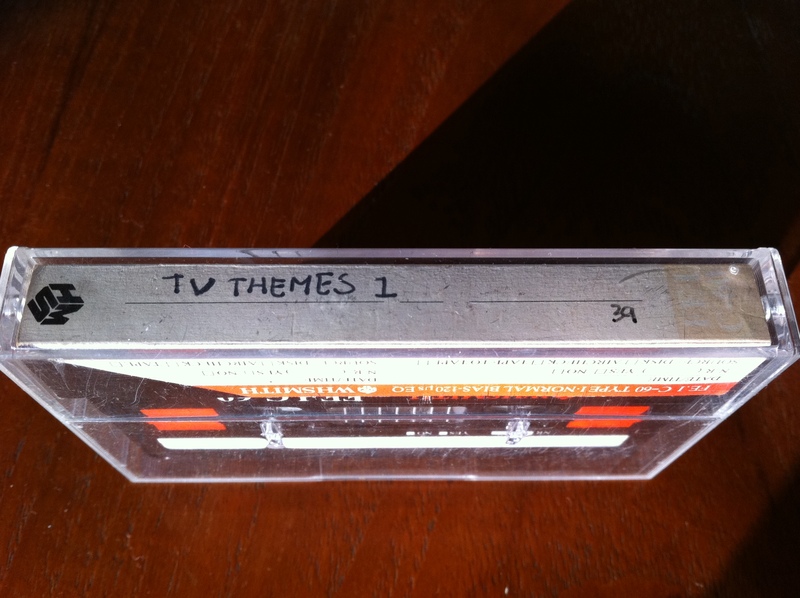 I started taping theme tunes off the television in early 1985. I would go to compile three volumes of cassettes, spanning the years 1985-87 and a total of 94 programmes. I’m not sure what prompted me to start. Perhaps I heard somebody talking about it at school. Perhaps the family had just invested in a portable tape recorder (this is more likely). Either way, I loved doing it and always loved listening to the end result. 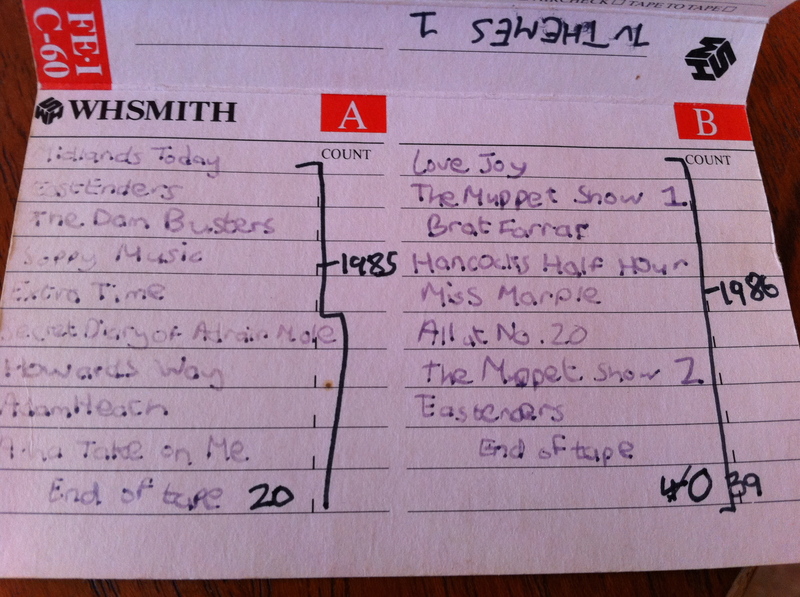 Side one track one of this first volume is the BBC children’s comedy drama Who Sir? Me Sir?, which I’m sure is barely remembered by even those who appeared in the cast. More kids’ fare follows: Fraggle Rock, The Family Ness and Dogtanian. But then it gets interesting, in the shape of Treasure Hunt (still one of the greatest TV themes ever) and Fireball XL5, which I probably captured during the school holidays when the series was being flung out disinterestedly by Central. I’m listening to this tape as I type, and I’m struck not just by how great most of the themes are, but also by how well the cassette has weathered the decades. The sound quality is pretty good – damn good, actually. I think I had fairly decent taste back then. I wouldn’t turn my nose up at many of those shows today, save perhaps Brat Farrar and (on the other side of the tape) Zorro and Son. “Soppy Music” sounds today like something that must have accompanied a testcard or Pages From Ceefax. Adam Heath is a misspelling/mishearing of Adam Faith, which I must taped off the radio to fill up the end of the side (ditto A-Ha). Extra Time, meanwhile, was a Saturday teatime show on BBC Radio Leicester, hosted by John Rawling. As you can see, I didn’t discriminate. Flagships shows and humdrum efforts alike were recorded. Elsewhere Stilgoe’s On is next to Duty Free, and Bergerac is sequenced after Food and Drink. The fact these tapes still exist at all is as much to do with my own archival instincts as the longevity of WHSmith-branded cassettes. Whatever went in to the manufacture of these pocket money treats has weathered the passing of time with hat-doffing aplomb. I’m puzzled by this, as Mother’s Day in 1986 wasn’t until 9 March. Perhaps what was originally planned for this particular Art lesson had to be scrapped for some reason – a shortage of crepe paper, not enough Copydex – and a substitute had to be found. It was published in 1984, so was already two years old by the time it came into my possession (either bought for me, or at my request). 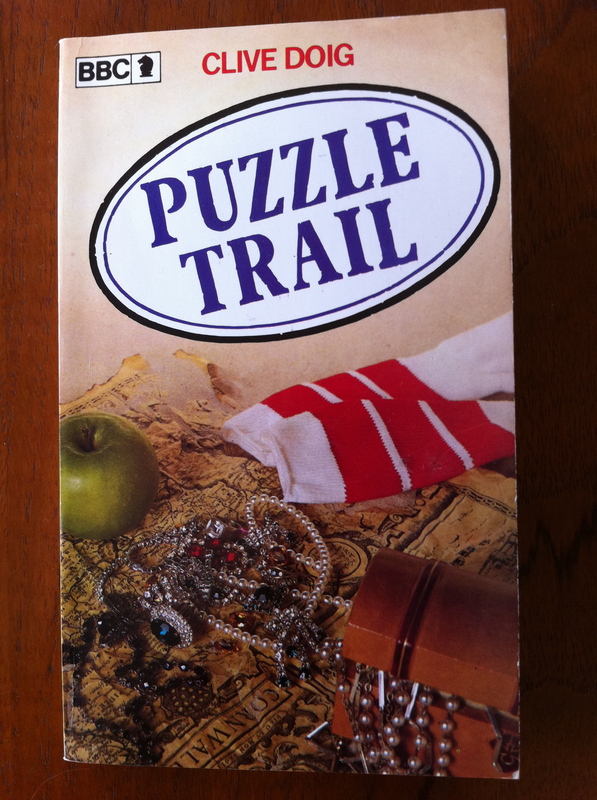 I always enjoyed Puzzle Trail. I would have been four when the first series was shown, yet I must have seen some repeats for I remember the hosts of the second series (from 1981) Tommy Boyd and Sally Grace fairly well. I also remember not being convinced by Davy Jones (“of The Monkees fame” as the book puts it) who helmed the 1984 series. He didn’t know how to do funny voices. 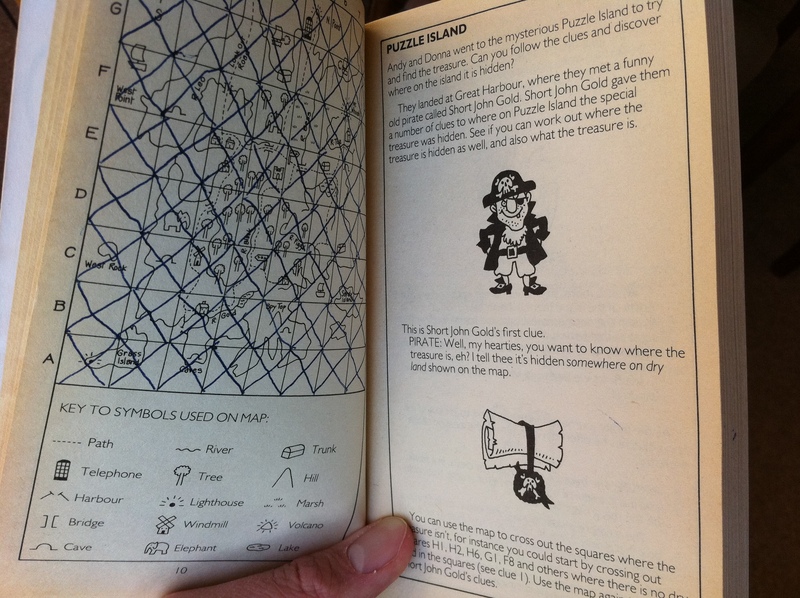 …though on closer glance it appears I have crossed out every single square. Oops. Either I lost patience or got angry. I don’t know why; I could easily have cheated, as all the answers are listed in the back.